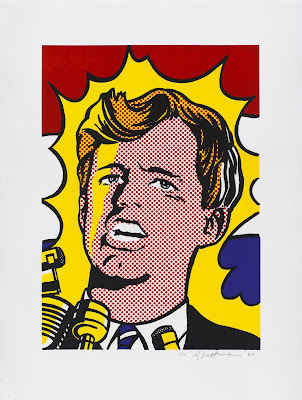 Driven by a peacemaker’s passion and righteous urgency, presidential candidate Robert F. Kennedy emerges as a red-hot rebel in a Roy Lichtenstein pop art print. Time commissioned it as a cover image for May 24, 1968, just two weeks before Kennedy was killed in Los Angeles. In his graphic print, now on display at the Smithsonian’s National Portrait Gallery to mark the 50th anniversary of Kennedy’s assassination, Lichtenstein produced a fierce facsimile of a man with a message. Using bright colors, Lichtenstein represents the emotional force of a fighter pushing himself to the limit as he nears the final primaries of his campaign. To capture the frenzy of Kennedy’s campaign and his zeal for change, Lichtenstein gives him the look of a superhero ready for battle.